Duxbury Systems leads the world in software for braille. The Duxbury Braille Translator (DBT) is used by virtually all of the world's leading braille publishers. No one supports more languages than Duxbury Systems -- DBT supports over 150 languages in either uncontracted or contracted (when such rules exist) braille. Our software can produce contracted and uncontracted braille, mathematics, and technical braille. The word "Braille" in many languages: كتابة بريل, ব্রেইল পদ্ধতি, Braillovo písmo, Braille-alfabetet, Brailleschrift, Σύστημα Μπράιγ, Brajlo, بریل, 盲文, 점자, Brailleovo pismo כתב ברייל, ბრაილის შრიფტი, Braila raksts, Aklųjų raštas, Браилово писмо, 点字, Punktskrift, Alfabet Braille'a, Alfabetul Braille, Шрифт Брайля, Braj, Braillovo písmo, Braillova pisava, Брајева азбука, Pistekirjoitus, Punktskrift, อักษรเบรลล์, Braille alfabesi , เบรลล์, Шрифт Брайля, بریل سسٹم, 凸字, 盲文. 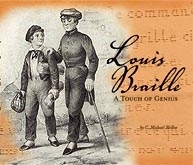 Louis Braille's life is captured in a new biography entitled Louis Braille: A Touch of Genius.